This was a bit of a let see what I could come up with sort of dinner so the measurements are a little rough so do play around with the amounts based on how many hungry mouths you have to feed! It served the boys and I for dinner so for a family would need to be at least doubled. 1 cup (or more) of Tri coloured Quinoa (uncooked). To cook in the Thermomix either soak in filtered water for 1 hour or rinse and rub very well and place 900g of water in the Thermomix bowl and put the Quinoa in the basket and cook for 20 mins (check to make sure it’s translucent) Varoma speed 2 – 3. Set aside in Thermoserver to keep warm. 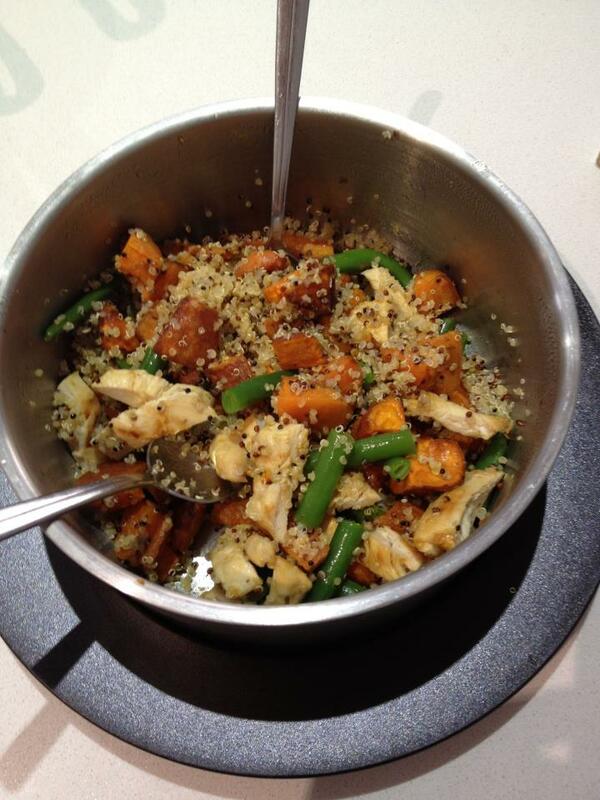 If you don’t have a Thermomix you can still cook your quinoa on the stove top in a pot (roughly the same time frame). 2 medium sweet potatoes – cut up into diced pieces and oven roasted in EVO or coconut oil sprinkled with dried oregano, 200 deg fan forced oven for about 15 – 20 mins. You could use pumpkin if you prefer. Handful of green beans (top/tailed) – you can steam these in the Varoma whilst doing the quinoa or quickly on the stove top in a steamer pot/pan for literally a few mins you still want them crunchy. Cut up into smaller pieces and set aside in thermoserver. 1 large double chicken breast (if feeding a few people, I only used a small piece that I had). Now you can marinade the chicken (or pork or salmon if you wish to use) in the below mixture in the fridge for awhile (will give the dish loads more flavour or you can baste the chicken as you pan fry it) or you could even try steaming it marinated in the Varoma. Mix together and baste on chicken or marinade chicken for at least an hour or two if time permits. Pan fry chicken in a little EVO and slice up and put in Thermoserver and mix with all the other ingredients for a quick and easy light dinner, lunch or side salad! The most versatile bolognaise sauce ever!